The days of transferring files via Bluetooth and USB cables are coming to an end. Sharing files between devices and friends can be easy and fun if you have the right tool for it. Nowadays, we have apps that offer high speed transferring rate, that too free of cost. Xender is a free App on both Android and iOS that helps you transfer a variety of files. You will be able to transfer photos, music, videos, documents, Apps and other media at lightning speed between devices. Almost every kind of files such as photos, videos, document and music can be transferred with this App. Also allows you to share ZIP, .APK files between devices. Supports cross platform sharing like IOS to android and vice versa. It uses the WiFi of your Smartphone for sending and receiving files– no Internet connection required. It is 200X faster than conventional Bluetooth. Xender can be installed on pretty much every Smartphone OS such as Android, Windows Phone and iOS. You don't need to carry USB cable around with you. With internet connection, the transfer rate is extremely high and it won't use data much. "Group" feature enables users to transfer data to more than one participant simultaneously. SHAREit helps you to transfer the data that you want to send between different devices. SHAREit for PC even enables you to transfer files between 2 or more users. Allows you to share any multimedia files like music, videos, images, pdfs, .docx, .exe and even the whole folders through it. No need to carry inconvenient drives like the USB cables. It does not need an internet connection to transfer the data from one device to another. The transfer speed is much faster as compared to the traditional Bluetooth sharing system. No limitation on the size of the content. QR scanning is used for the fast connection and transfer of files. With SHAREit on your PC, you can control the power point presentations as well. It can be used to browse files on your phones from your PC. Also allows you play media files from your PC on the mobile devices. You can enjoy the app on your windows and mac using Shareit APK. Even though Zapya is comparatively new in the market, it has all the features that of SHAREit and Xender. Furthermore, it also offers features which are exclusive it. Allows you to chat with an individual or a group. Zapya also has Air hockey which you and your friend can play. With its “Phone Replicate” feature, you can easily backup and transfer data from your old phone to the new one. The User Interface of Zapya is user friendly compared to other major file sharing Apps. You can also hide files and apps which you don’t want others to see. 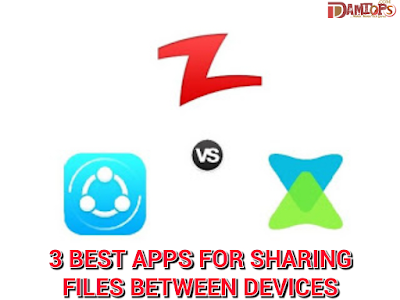 Try these Apps for exceptional, hassle free and quick file sharing experience without any extra cost. I like the above hared article very much, thanks for sharing.